If you are 14 yrs 6 months or older, you can get this Colorado DMV approved Teen Drivers Ed with All Star Driver Education, the leading driving school. Learn from the convenience of your home. Colorado teens can get an instructional (learners) permit when they turn 15 years old. However you need to complete drivers ed to get your license. Our course is geared towards teens who are interested in obtaining their learner’s license once they are least 15 years old directly from the Division of Motor Vehicles (DMV). According to Colorado DMV, your permit will depend on your age. Between 15 and 15½ years old: You need to complete a drivers education course and receive an affidavit of completion from an DMV-approved driving school. As of April 23, 2007, if you are at least 14½ years old, you can take an approved Colorado drivers education course entirely online. Once you pass the written permit test, you’ll be issued a Driver Education Permit. If you are between 15 years 6 months and 16 years old, you have the option of taking a driver awareness class instead of an online drivers ed course. A Driver Awareness class is more costly and requires students to spend time in a classroom-based study session. At this stage, you’ll get a Drivers Awareness Permit. If you’re 16 to 21 years old, the Colorado DMV does NOT require any official driver’s education to obtain your CO driver’s permit. You can, however, still benefit from learning drivers ed for your safety and for better insurance rates. You will be issued a Minor Instruction Permit at this stage. All these permits expire three years from the date of issue. All Star Driver Education is now proudly offering online teen driver’s education in the state of Colorado. We are excited to bring this opportunity directly to your home in such a comfortable and convenient way. Students with busy school and extracurricular schedules don’t need to worry about finding time to go to a driver’s education class anymore. With All Star’s newly released online teen driver’s education program, students can take the class wherever and whenever you choose at a pace that’s comfortable for them. Once you have registered and paid for your online class, the account will remain “locked” initially until we receive a Colorado Online Contract. You can find the Colorado Contract when you log into your account. Also, in order to issue your certificate, we need the Pre-Registration code that is given to you when you register on the CO DMV website. Once you go through applying for the permit/license and get the confirmation code there is a PDF link to the page with the code on it. It also emails it to you about a day later. Save the code for when you complete the course. Our class is 100% certified by the Colorado Division of Motor Vehicles (DMV) and will include the full state required 30 hours of classroom time for our new teen drivers. We are confident that our online program will help set your student up for success as they further continue with their driver’s education. 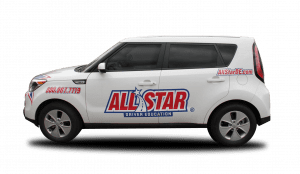 All Star offers a uniquely developed online program approved by the Colorado DMV (Division of Motor Vehicles) that will help your teen first time driver learn the rules of the road, defensive driving skills, preparation for their permit test, and can even make you eligible for discounts with your auto insurance! If you have any further questions, you are welcome to email us directly at online@allstarde.com, or feel free to contact our corporate office directly during normal business hours. Module 20: Get Ready to Drive! Am I eligible for Driver’s Education? Students are required to be at least 14 years 6 months old to be registered in driver’s education. Is driver’s education required for me? Any students under the age of 16 years 6 months old are required to have a certificate of completion from a certified driver’s education course. I can’t log in. My account says “pending”. Even though the account is successfully made and entered into our system, we do still require a copy of the Online Contract before we can “unlock” the account for the student to begin actively working on the course. Where do I send my contract? Once you have completed the Online Contract signed by both parent and student, you are welcome to scan and email them to online@allstarde.com, or you can fax it to our corporate office at (734)665-7680. If you do not have access to email/fax, then you are welcome to mail it to our office at: 75 Aprill Drive, Ann Arbor, MI 48103. As soon as we receive the contract, we will send you a “welcome email” that will let you know your account is ready to be accessed! It will also provide you with the website of where to login, your current username we have on file, and a brief overview of the course. The state allows you to work on the course for up to 6 hours a day. If you hit that 6-hour mark, you will be logged out of your class and have to wait 24 hours before you can log back in. We recommend logging out a few minutes before you hit that time limit. Doing that, you will be able to log in again the next day at any time. In order to issue your certificate, we need the Pre-Registration code that is given to you by the CO DMV website. If you did not create an account before, you will need to go to https://mydmv.colorado.gov/_/ and complete one. Unfortunately, by state law, we cannot email or fax certificates. All certificates are required to have a handwritten signature for the Colorado DMV (Division of Motor Vehicles). There is a $30 charge for any re-issued certificate. Please call our corporate office at (800)967-7719 when you are ready to make payment, and we’d be happy to get another certificate generated and mailed to you as soon as possible. We do offer Priority or Overnight mailing for an additional cost. If you would like the certificate to go out same-day, you must call in your payment before 3:00 pm EST, otherwise it will go out the next day. Priority mailing is an additional $30.00 and an Overnight is an additional $75.00. If you are interested in expediting your certificate, please call our corporate office when you are ready with payment and we can help you further.